Last week I posted a picture of an opening hand from Burn that I think is unkeepable. Most people responded in the comments that it seems like a no-brainer with 17 theoretical damage in it. I think this showcases how Modern really rewards people for the most in-depth understanding of their deck. Burn is a pretty simple deck to evaluate hands with, but I think it’s important to take the time to learn the early-turn sequences so you can make a decision on your opening hand. There are a lot of times that people lose games and matches entirely by keeping bad hands. To understand why I think that hand out of Burn is so poor, you have to be familiar with the way games play out more specifically. Today I’ll be going deep on Burn and explaining how its game plan should inform your mulligans. I hope you’re ready! Two lands. Not too many or too little. Searing Blaze might not be a real card if we don’t draw another land. Adding up all the burn spells in this hand we have a theoretical 17 damage. That’s enough to kill an opponent who takes fetch-shock damage at some point, or one who doesn’t with a single drawn burn spell. But how quickly can we actually get that done? When you play Burn, you ideally want to be able to close the door by the end of your fourth turn. That’s when your mana efficiency from the early game starts to become less of an advantage and an opponent’s more powerful cards can take over the game. Obviously not every game you can win on turn four, but you strongly consider mulliganing hands that can’t win that quickly. Knowing we’re aiming for turn four, we can assume we’ll draw 3 or 4 extra cards—let’s consider what they might be that would let us achieve our goals. Turn 4: Well unless our draw steps were exactly Lightning Bolt and Boros Charm, we’re probably not going to be able to kill this turn unless our opponent took damage from a fetch. This also assumes we drew a land in the first three draw steps. A lot had to go right for this hand to become anything reasonable. This hand likely doesn’t beat a reasonable draw from Ad Nauseam. It loses pretty handily to Snapcaster Mage plus Spell Snare. I’m not entirely sure it beats a Valakut deck if they’re smart and don’t leave Sakura-Tribe Elder in play. Part of the reason I play Gitaxian Probes is to avoid as many hands like this as possible—the reality is that there are way too many two-mana spells clogging this hand up for it to win against an unknown opponent. Let’s look at a sequence if we mulligan this hand into something similar but with a creature. If we trade one of the Boros Charms and a Searing Blaze for a Goblin Guide our hand turns out so much better. Our new hand only has 10 damage worth of burn, but look how it plays out. Turn 0: Scry 1. We can pretty safely put any lands to the bottom as this hand doesn’t need three to function. I would keep any one-mana spell. Turn 4: Rift Bolt comes off suspend. If we didn’t draw a land we can cast Skullcrack or Lightning Bolt and win the game. Goblin Guide attacks for 2, Swiftspear with two prowess triggers attacks for 3, and the two spells that deal 3 damage deal 10 damage this turn. Were you counting in that theoretical game how much damage Goblin Guide did? If you cast it on turn one and they don’t interact with it, it adds so much damage to your clock. Over the course of four turns, Goblin Guide deals 8 damage. While that seems pretty obvious as you’re reading this, how many people look at their hand and see Goblin Guide as a burn spell that deals more damage than Lightning Bolt? Creatures are very important for Burn, more so than the number of burn spells that start in your opening hand. Even a hand with an Eidolon of the Great Revel (which doesn’t attack an opponent down as quickly) can put on so much more pressure than a hand full of burn. If your opponent casts two spells and you attack once with the Eidolon then it’s already more mana-efficient than Boros Charm (the most mana-efficient burn spell at two mana). The other thing that creatures do is require your opponent to interact and thwart their own game plan. If we have a hand with a Goblin Guide or Monastery Swiftspear, then it puts the onus on the opponent to deal with it. 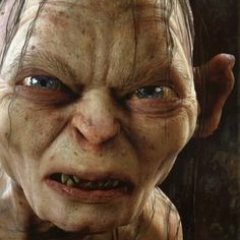 It feels great when Jund uses their second turn to Terminate or Lightning Bolt your Goblin Guide instead of playing a Tarmogoyf. Stunting your opponent’s development by forcing them to deal with your threats gives you more time to finish the game. If I was a graph master I’d be able to show you the bell curve in win rate as you increase the number of creatures in your opening hand. Basically, if you can open with three Goblin Guides and two land you really can’t ask for a better hand. The triple one-mana creature hands are the most explosive, and even in the fact of beefy blockers from the faster decks can end the game quickly. After that, however, you’re more likely to run into the problem of too many big blockers and no profitable attacks. Eidolon of the Great Revel is a card that I think goes underrated too often. While it’s often counterintuitive to play a card that deals a lot of damage to you (every spell in the deck triggers its ability) you will truly appreciate its power when it absolutely annihilates a deck. I played a match against Storm during the last Grand Prix Los Angeles and almost had him concede before I had even taken a turn. During game two I kept a hand with two lands, one burn spell, and three Eidolon of the Great Revel. Although Storm plays Lightning Bolt, it was unlikely they would find it before the three Eidolons were able to kill him. Spoiler alert, when it costs you 6 life to cast a Serum Visions you don’t win the game. All of this talk about creatures, however, seems to contradict my opinion of Wild Nacatl. It’s true. I don’t like playing that creature because it’s too slow. The fact that it doesn’t have haste is really the deal-breaker for me because it almost assuredly won’t deal any damage if my opponent has a removal spell. With Monastery Swiftspear and Goblin Guide you can hold them until there’s a good opportunity to sneak them in around removal. Wild Nacatl needing a whole turn to get going really just doesn’t do it for me. The fact that you also need a Sacred Foundry for it to even be a reasonable attacker is another strike against it. I’ve received a ton of questions about my choice of sideboard cards, asking why I’m not playing more flexible answers in some slots. Why Surgical Extraction instead of Rest in Peace, for example? Well, scroll up a little and you’ll find your answer. When is there a good time to cast a Rest in Peace? I think you’re going to be pretty hard-pressed to find one. Sacrificing a whole turn to play Rest in Peace just isn’t ideal and doesn’t solve the problem of the glut of two-mana spells. This also doesn’t really include the problem that some of the best Dredge draws can just put a bunch of power into play before you even have enough mana to play Rest in Peace. What does this mean for our sideboard cards then? We want things that are mana-efficient and powerful. Sacrifice the long-term gains for short-term power. That’s why Path to Exile (for example) is one of the most important cards in the Burn sideboard. It doesn’t matter if our opponent gets a land if we kill them. Ensnaring Bridge is really the exception to this plan because it doesn’t speed the game up, it actually slows it down. Resolving a Bridge gives us time to draw enough burn spells to kill our opponent while their larger creatures can’t attack us back. Which brings me to my last point about sideboard cards: don’t over sideboard. Just because there is a “use” for a card in the matchup doesn’t mean you should put it in your deck. Bringing in Path to Exile against a Jeskai Control deck because it can remove Celestial Colonnade is just asking for a bad time. Burn’s maindeck is tuned to be quick and ruthless. If you remove too many teeth then it doesn’t quite have the right amount of bite. Over-sideboarding is the reason I don’t want to play with Grafdigger’s Cage or Rest in Peace. Just because they’re more flexible doesn’t actually mean I want them in for those matches. First turn faithless looting can bin both of our bloodghasts. Turn 2, we can fetch, decide whether or not to trigger the ghasts (I usually will, unless I need to ensure that I can trigger amalgam later), and conflagrate for zero. On turn 3 we can flashback conflagrate for 4 to bin any dredgers in hand, then follow up with a dredge on our next draw step and a flashed back faithless looting! Great hand: 3 lands (crucial! ), fast beats and disruption via creature removal! Great Read, really like how you broke down the hand. My take on the dredge hand, I would keep. 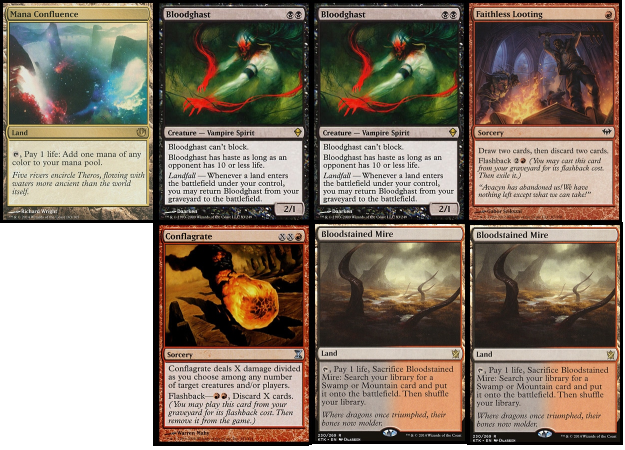 Reasoning being turn 1 faithless looting , draw regularly hope to hit a dredger to discard along with a bloodghast. Turn 2 dredge the hopeful dredger, play second land get back bloodghast and hopefully amalgam with other dredgers now in your graveyard. For me I would mull the dredge hand . Well I’m glad I’m not totally crazy when I was the only one last week who said I wouldn’t keep that opening burn hand. Helps that my #1 go-to Modern deck is Naya burn. Rule of thumb for me is to never keep an opening hand without a dude and no more than three land. Eidolon is super underrated. I discovered its power when playing vs. elves and infect. Two Eidolons on board left unanswered straight win the game. If we go to game two I will sometimes side out Eidolon vs. Tron seeing as my op will have cycled most of his eggs not getting much value out of Eidolon and will actually hurt me more than it does them. Goblin Guide is the 100% best creature in the deck, not only does he present 2+ damage at least if not more he also provides us with pseudo hand information. Helps us play around things that we know are coming. I like how you throw the burn hand back because you need a one mana creature… do you then stack the deck to make sure you get one with your six card hand? We usually dont mulligan decent hands because there is no assurance we wont just mull into oblivion or find ourselves with the exact same problem with one less card to use. When you know the hand wont win the game anyways you toss it. But you need to know what your opponent is on to make that call. If your opponent is on infect that searing blaze looks a lot better. When your hand deals 17 and you just need to not peel three two drops in a row thats pretty good odds. Id like to see you throw it back and mull to four keeping a hand of land land searing blaze boros charm as your just deserts! I would mulligan the hand because on average, a 6 card will be as good or better than that 7. It’s true that there are not a lot of 1 mana creatures in the deck but those hands are just head and shoulders above other hands that it is worth mulliganing for. It’s more obvious in a deck like infect that if you dont have 1 of your 12 infect cards you should send the hand back but it’s still pretty close in burn. Loved the article. I completely understand the reasoning behind mulling such a hand, and i can truly get behind that. About the current hand you are mentioning… I would mulligan this hand without regrets. 2- It only brings 4 power to the table, and on turn 3, because they won’t have haste on Turn 2. This deck aims to have an overwhelming position over our opponents in the first turns, not to “gain value”. Sure, the Bloodghasts won’t be “dead” on the graveyard, but this is by far one of the slowest, and dependant hands you could manage. And you can manage better. As someone who plays a lot of Naya Burn, I really think you can’t afford to mulligan hands like that. Burn is perhaps the deck in Modern that has the most to lose from a mulligan, as its whole strategy rests on using a mass of individual cards to ping your opponent’s life total down to 0. While the hand you presented is not stellar (namely, it has no creatures), it’s in the clear keep category for me. On the play, it opens with a weak start, but there are plenty of scenarios that have you goldfishing 17-20+ damage by Turn 4. Drawing a Land, Goblin Guide, a Swiftspear, and Eidolon, a Lavamancer, a Rift Bolt, a Lava Spike, or Lightning Bolt pretty much guarantees 17-20 damage gold-fishing by Turn 4, and in the rare scenario where you don’t (you draw basically only 2 mana spells or totally flood out against someone with no creatures), you’re still pretty much a lock for a Turn 5 kill, which will often get you there. On the draw, this hand looks even better. You have decent odds of getting out a T1 creature and are basically guaranteed to get a kill on your turn 4 with the extra card. In contrast, a lot can go wrong with a mulligan to 6. You could be forced to keep a 1 land hand that goes nowhere, you could draw a similarly mediocre hand with a bunch of 2 drops minus 1 less piece of removal, you could draw a hand with 3+ lands, which in almost any scenario won’t be as attractive, etc. I agree creatures are great in Burn, and your most explosive wins will be a pile of creatures followed by an Atarka’s Command or a few pieces of Burn. An Eidolon will just flat out win games against certain decks (or give them serious problems if they can’t find removal). However, it’s the rare game where a T1 Goblin Guide represents 6 or even 8 damage. Those games happen, and it’s terrific to have that kind of ceiling, but just as often your goblin guide gets bolted or blocked after 1 swing. Sometimes your turn 1 goblin guide on the draw might as well read “your opponent takes 0 damage, must spend 1 red mana, discard a lightning bolt, and draw a land card into their hand”. Ultimately, we just can’t be that picky with Burn. Every mulligan is a flirtation with disaster and should really only be done if you explicitly know your hand is bad against the match-up or your hand is way too fragile to get you there (has 4+ lands, 1 or 0 lands, no turn 1 play, and some other very extreme corner cases, etc.). I think that Dredge hand is probably keepable, though I don’t play a lot of Dredge. It has some immediate gas, an enabler, an awesome piece of removal, and the chance to look at several cards through the next few turns. So it doesn’t take too much for the hand to get the engine going. This article compares two cases. Case 1 is the 7 card hand, and case 2 is the 6 card hand. In case 1, your opponent had Spell Snare and Snapcaster Mage. In case 2, you drew Monastery Swiftspear and your opponent didn’t have any interaction at all. Come on, how often do you really get 8 damage out of Goblin Guide? 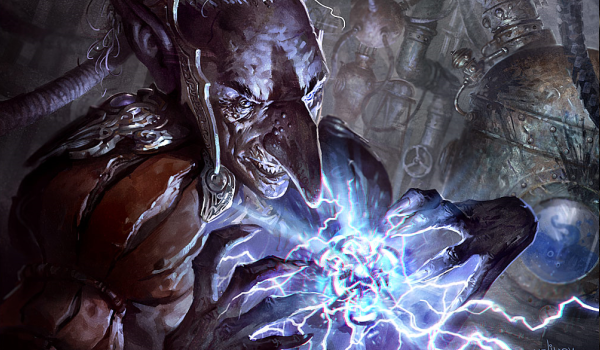 Path and Bolt are the two most popular spells in the format. Even a Wall of Omens shuts down your plan here. Also, if you don’t want to see Searing Blaze in your opening hand, why are you main decking it? I mentioned the worst case scenario for the first hand. Not necessarily the scenario that is likely to happen. Given the prevalence of infect (which the first hand has a hard time beating) and dredge (which the first hand has a hard time beating better dredge draws), I don’t think it’s unreasonable to try to get a 6 card hand with a creature. The real issue with the first hand is that even if you get a 6 card hand with 1 less 2 mana spell, you likely won’t cast them all before you die anyway. The hand doesn’t interact with creatures particularly well and doesn’t pressure with creatures. I think the fail rate of the first type of hand is too high.